But if we extrapolate this kind of thinking, what it ultimately says is that life should never come before our art. We should never take a step back to start a family, or care for a sick family member (or be sick ourselves), or work a desk job so we can make the payments on our student loans. And if that’s truly the case, we are eliminating a whole crop of artists (and a variety of different voices) purely on the basis of circumstances. Obviously, the system is not set up to be a very nurturing one. Given that, we can wait and hope for the system to change or we can decide to believe in our own value and continue to find ways to be heard. Waiting has never been my strong suit. In light of that, I keep focusing on two concepts. The first is that the richer your life experiences are, the richer your storytelling will become. Ages ago, when I was in college studying theater, a fantastic actor by the name of Michael Milligan came in to speak to us about life in the business. One of the things he said which has stuck with me through the years was “you can’t play these legendary, three dimensional Shakespearean characters if you haven’t lived a three dimensional life”. It’s important to study and have solid technique, But it’s also important to participate fully in the human experience. That’s not to say you should devote yourself to method-acting or unhealthy life choices. Please don’t. However, our job as theater artists is to create representations of real life. So why would we regard those real life experiences as a detriment to our careers? Life is going to do what life will do. Embrace it as fodder for better future works. 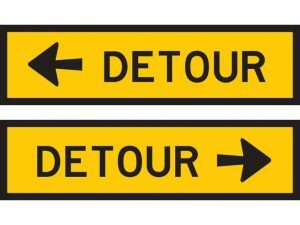 The second idea that I’m trying to keep in mind is that every “no” is a detour saying “not this way – you need to go a different route”. This is an idea that I’ve been encountering in some of the books I’ve been reading about Stoicism. But it really hit home for me when I was listening to this podcast with Srini Pillay. In it he talks about how, before you ever set out in pursuit of your goals, you should resolve to change course (instead give up) when things don’t work out the way you hope they will (as they inevitably do). Which is what we do in any number of situations where the stakes are not nearly as high. If I’m at home and I want to have spaghetti and meatballs for dinner, but discover that I don’t have any pasta, I don’t give up and take that as a sign that I’m not meant to eat dinner. I adjust. Maybe I run out to the store. Maybe I make a peanut butter sandwich. Maybe I order something or go out somewhere. Just because the traditional path (or the most obvious path) ceases to be an option doesn’t make the goal impossible. It just means you need to expand your thinking about the different ways you could achieve your goals – and perhaps clarify why you want those goals. If my goal of spaghetti and meatballs is just about eating something for dinner, than any old dinner option will do. If I am craving that and ONLY that will do, then success becomes a much narrower target and there may need to be some negotiating. Surely if we can adjust our dinner aspirations with such dexterity, then our life goals deserve just as much flexibility. I don’t mean for that to be trite. It’s easy to adjust something like dinner for several reasons. For starters dinner is a fairly simple process – it’s four or five steps from start to finish that you’ve done (and adjusted around) hundreds of times. Additionally, if dinner doesn’t turn out as planned, life goes on without too much heartbreak. It’s a significantly smaller scale. Whereas, a career often spans decades with numerous twists, turns, successes, and failures. Often, they become closely tied to our identity, making them seem even more urgent and precious, and leading us to feel like the prescribed path is the surest was to achievement. It might make us more anxious to adjust our thinking around the things that matter more in our life, but it’s clearly possible (given that we do it without a second thought in millions of other smaller scenarios) and it’s worth it. Your stories are valuable and needed. Your perspectives are valuable and needed. You will not hear that message from this industry. You will not hear that message from this society. You will have to be the one to tell yourself that – over and over and over again. Stepping back from the nitty-gritty details of the business to life your life doesn’t make you “rusty” at telling stories. If anything, it reconnects you to your humanity. As artists, we preach the value of creativity. Creativity is not just a luxury item to be let loose when conditions are perfect. Creativity is what gets us over, around, and through the difficulties and limitations that life throws at us. Onward.